The Philly Special was immediately regarded as a brilliant call not just because it worked, but because it worked so well. The handoffs were clean, the throw was perfect, and Nick Foles looked the football in all the way while wide-open in the flat. Apparently, however, the Philadelphia Eagles' first few attempts at what is now the most famous play call in franchise history weren't so smooth. 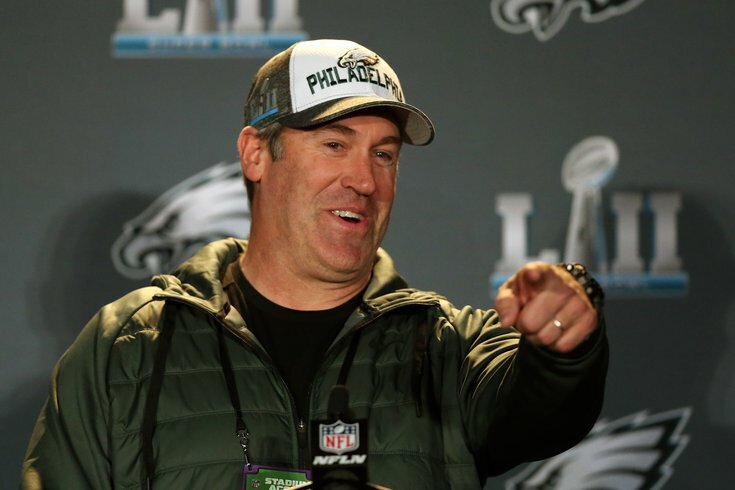 Eagles head coach Doug Pederson appeared on Colin Cowherd's radio show Friday and discussed, among many other Super Bowl-related things (because the Eagles won the Super Bowl), the good ol' Philly Philly. According to Pederson, the play didn't produce an instant connection between Foles and now-Chicago Bear Trey Burton. "I was hoping to get it called in the Minnesota game and didn’t get it called. But I can remember the first three times that we called it in practice, Trey Burton air-mailed the ball over Nick’s head. And we kept working it, working it, working it, and we kept it in for the Super Bowl. It just worked, it worked to perfection. As if the play's legend couldn't grow anymore, now we find out it was labor of love that Pederson had to massage into a functioning play in time for the team's clash with the New England Patriots.